ED: We've added some FAQs to this post. Scroll down to see them. We at LoveYourself know exactly how you want it -- easy, breezy and with immediate results. And this is precisely what LoveYourself will give you with Quickie by LoveYourself Confidential. 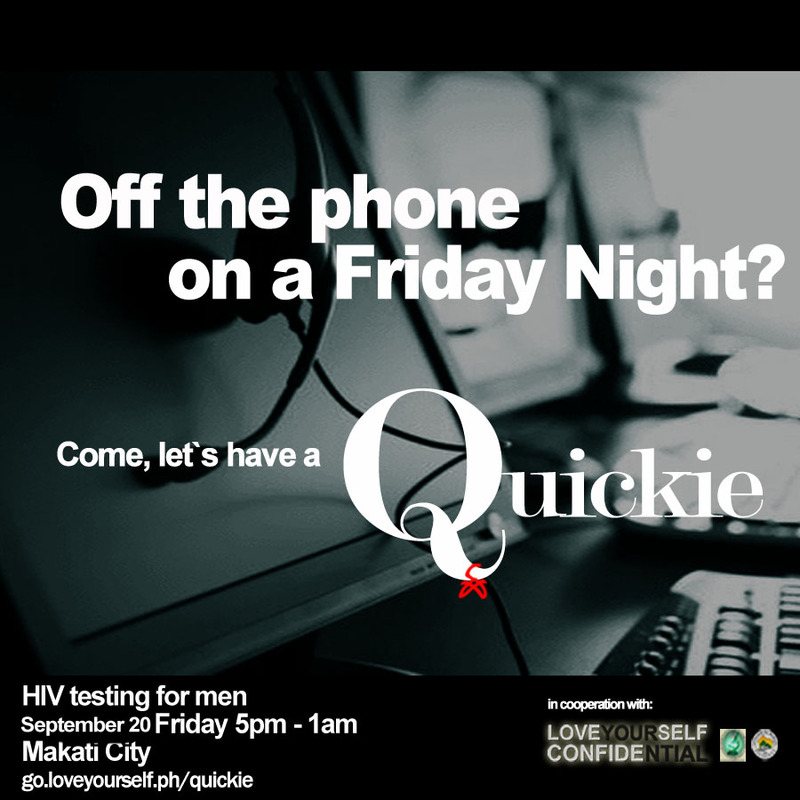 On September 20, Friday, we are holding a special free HIV testing event for men at the Makati Friendship Suites from 5 PM till 1 AM (next day). This effort aims to provide a convenient time and venue for guys who will be just coming out from school or work, even those who are running the night shift on a Friday night. Our screening comes complete with our trusty facilitators and counselors who are all set and prepared for the Quickie: they will be there to guide you every step of the way, from the one-on-one pre-test counseling right down to the delivery of test results. Of course, LoveYourself has always prided itself in maintaining the confidentiality of our clients' records. It may be a one-night-only Quickie but we assure you that our lips are sealed. Headed to a hot Friday night party? Why not stop by first for the Quickie? Interested clients may sign up for Quickie here. Waik-ins will also be accommodated. So go ahead and visit us on the 23rd. We know you want to get our kind of Quickie. Q: How do I go to Makati Friendship Suites? MRT-Jeep: Detrain at Guadalupe MRT Station, go the Jeepney Terminal at the back of Guadalupe Commercial Center and take any jeep going to Pateros, Market! Market! and FTI. Tell the driver that you wish to alight at Makati Friendship Suites. This is a 1 minute and 30 second ride. Taxi: Tell the driver to take you to Guadalupe Bliss (Makati Friendship Suites) along Dr. Jose P. Rizal Extension, Brgy. Cembo, Makati. Q: This is my first HIV test. I do not know what will happen during the test. How will the HIV testing process go? Q: What is the best time to drop by? Everyone is encouraged to come as early as possible. Testing begins at 5 PM on Friday, September 20 and the cut off time will be 1 AM on Saturday morning. HIV screening and counseling is free of charge, you do not need to pay for anything. Q: When do I get the results? 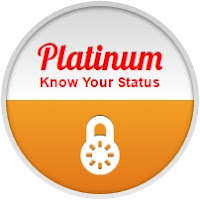 You can get your HIV test results on the same night while your Syphilis and Hepatitis B results will be sent via e-mail/SMS one week later. Your privacy is one of our main concerns. 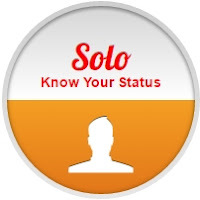 Only you and your counselor will know your results. Q: Can it be anonymous? Do I have to give my real name? We encourage our clients to feel comfortable in filling out the testing form with their real names, but it is not an absolute requirement. You are not required to bring anything. You will not be asked for ID. 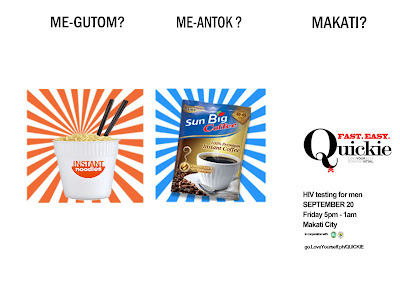 Q: Since there will be a blood test, should I stop eating before the HIV test? Is fasting required? 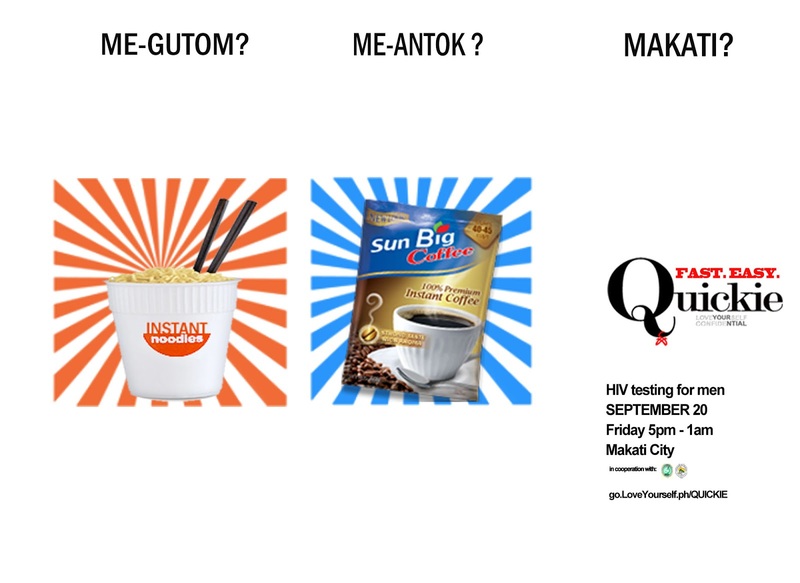 Although the HIV test involves the extraction of blood, there are no fasting requirements to be followed. The test will look for HIV antibodies in your blood, and eating food or drinking anything will not affect the results. Q: Can I bring a friend? What if he doesn’t register? Yes, please do. He can come even without registering. Q: I'm a girl, can I go? This event is exclusively for men. Feel free to drop by our LoveYourself Hub (#1850 Leon Guinto St., Malate, Manila.) for testing. Ready? Visit http://go.LoveYourself.ph/QUICKIE to register. See you on September 20!